From the FarmVille toolbar to a virtual pet that runs on your browser bar, Conduit's Ltd. is helping gamers connect with games without having to change their web page. You might have never heard about Conduit Ltd., but odds are you've seen some of its technology. Conduit created a technology that allows publishers an easy way to create browser bar nested applications that bring games, players, and gaming communities together in the tiny spaces at the top of your web browser. Toolbars are certainly nothing new, and most traditional examples are intrusive programs that change your home pages, redirect your searches, and generally make themselves so much of a nuisance that you're looking for a way to remove them almost as soon as they've installed. 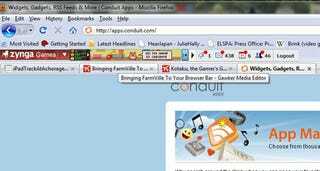 Conduit allows its customers to create browser-based applications that run in the chrome of the browser window. The FarmVille toolbar that shows you how much time you have to harvest your crops? That's Conduit. The Xfire toolbar that keeps track of your friends, lets you send messages, and updates you on the latest live streaming videos? That's them as well. Any company can use Conduit technology to create a quick and easy application that runs in the browser bar, from simple RSS feeds with instant notifications of new stories, to entire game, such as Pitsi, a tiny virtual pet that currently has more than 3.5 million users. That's a whole hell of a lot of Tamagotchi. The company has more than 220,000 publishers creating applications, and more than 100 million active users, according to company president Adam Boyden, and with the amount of flexibility the Conduit technology allows, that number will only grow. So why is Conduit important to games? "It's been very popular within the game space because companies have been able to build tools which have helped them make their games more easily accessible or interact with their game-related content more easily within the browser," says Boyden. "It gives game publishers, developers, and community sites a constant engagement potential with end users." It's not just games, either. The Conduit App Store features applications for Facebook, Twitter, and many different categories, making it possible to have most of the content you browse the web for easily accessible at the top of yours screen. Best of all? It's all free. Head over to the official website to see how Conduit can improve your internet gaming experience.